Some parts of the talk deserve an article on their own, so I will try to give you a summary and a feel for what happened in this article. This year the technical keynote was back in one of the big Moscone halls (the rest of JavaOne conference is still in another part of town) which provided a lot of space. The first part of the talk was a summary of where we are now. Java is still the number one developer platform and to maintain this, it needs to evolve while remaining to true to the qualities which it embodies (code clarity, readability, portability, etc). 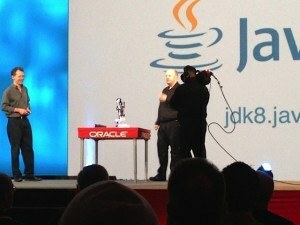 The last revolutionary release of Java was release 5 (10 years ago) and it has evolved in an evolutionary path since. Release 8 will be a revolutionary release with Lambda (which I will cover in detail in another article) as it marks a big change in the language (it makes changes to language, JVM and libraries). There is a weekly build of Java 8 available which is feature complete and Oracle wants people to try it, break it and report back. The main part of the talk consisted of a series of linked demos round a ‘chess’ theme which allowed a display of all the key technologies in Java with different teams on stage. First we had a Chess game running as an HTML5 client on IPad. The code was written in NetBeans, which could also be used to debug the code running on the IPad. You could even edit the DOM in NetBeans and dynamically see the changes. The server end was running on GlassFish 4 which was handling all the interaction and requests. The FX team had built their own tablet (the ‘DukePad‘) using a Raspberry FX (they have posted all the design schematics on the web) running a standard version of Java 8 build. 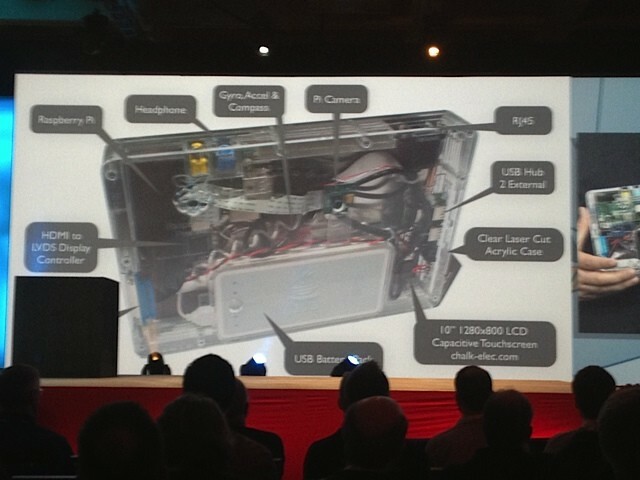 They had a JavaFX client running on it with neat animations and pieces being ‘stomped’ off the board when taken. 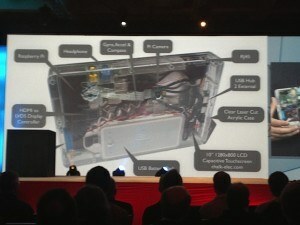 All the pieces were designed and animated in Maya and the data imported into JavaFX. The JavaFX team also commented during their demo that they had added printing to JavaX and there is a new component so you can embed Swing inside JavaFX (expect lots of demos this week with this). The Raspberry Pi has a very slow processor/memory (about Pentium II speed), although its GPU is very good and it was impressive (until they showed another Chess client running on a modern i7 Mac). 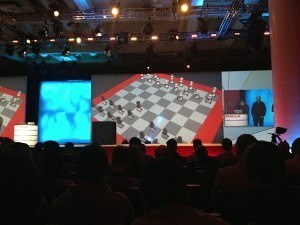 The final chess ‘client’ was a robot arm which moved the chess pieces on a real board – controlled by a Pi running Java. Mark Reinhold finished by talking about Java 9 and Oracle’s ideas for this – making use of GPUs for processing (Project Sumatra), Reificiation, Jni 2.0 (“accessing native code from Java should not be this hard”), and more memory efficient data structures to help with big data.